entering month 5 of delay. What is the over/under for delivery before 2019? I'm guessing it's not going to happen. We're currently only 4mo past the invoicing date, I'm not sure what "over/under" is meant to mean, but as it sits right now there's no reason for them not to be in shipping to me aside from the current holiday. PCBs are the only thing that's being waited on at the moment and once those are in hand shipping can happen right after. Wow has it really been 4 months?? This seems like it happened just the other day! Time has certainly flown. I am sure the holiday is holding things up so no worries. Plus the order was larger that held things up also. I am pretty excited and completely forgot a ordered this! I am really glad you reminded me. I think got a black one which is perfect. Since I got a set of Laser keycap's coming in. I out fit the board with some pink/purple LED's and now Laser will have a nice Unique one of a kind home! Correct. It's been 4 months, hence "entering" the 5th month. The over/under is a common betting term. If I'm being cynical and don't believe the budget96 would be delivered by years end, I would take the "over" odds to the bet. why would you equate 5 months past invoicing to 5 months of delay? Honestly I don't think there native English speaker. They could be using a translator. I just don't understand why they think we won't see these before the end of the year. I mean that seems a bit crazy. There still 3 month's left in my calendar year. If you look at the first post...the original estimated delivery was June. June to July, July to August, August to September, September to October. That would be four months past estimated delivery. Now, since we are in October and will be waiting into November, that would mean we are entering the 5th month of delay. Is it really that hard to understand? yea its pretty hard to understand why you think a group buy, that stated payment wasn't submitted until 6/24/2018. Would be finished and shipping in the month of June. There was also the fact Donutcat keep telling us, if we had a larger order of PCB's it would increase the manufacturing time significantly. We all knew going in this wouldn't be done in June. Shoot most of us expected it likely wouldn't be done in September. I think end of October start of November. Is a reasonable expectation. Though if it takes longer it takes longer. Donuts been very very transparent about things. Has updated the thread anytime we asked him to. I don't see the big deal perhaps group buys aren't your thing if your going to hang on Estimated dates. Keep in mind Group buys aren't Amazon.com. I do think group buy runner should be held accountable for what happens, its part of the risk of taking on a group buy. In this case there nothing to be upset over donuts doing a fantastic job. Has done a fantastic job in the past and has gone above and beyond from what I have seen and read in previous group buys so I am personally not remotely worried. I appreciate the support, though I would like to keep any arguing in here to a minimum to keep the thread in order. I do acknowledge that we are pretty far past my initial estimate for a delivery date. This being my first GB of this sort, using multiple components from multiple sources vs just keysets or cables from a single manufacturer, my estimate for delivery was at the very least naively optimistic, particularly so when even the order from GMK was delayed beyond that estimate. This experience will no doubt help me better understand the process for future buys, but for the time being I've just been trying to keep everyone updated as we move along and work through the delays to get everything out when I can, which I hope is acceptable for those involved. 1. I didn't think the group buy would be finished and shipping in the month of June. I knew it was not going to be complete in June. But I'm using the dates and data that are provided. Why should I assume any different? 2. I'm not "hanging on estimated dates." I made one statement of fact. I did not even mention any personal feelings or openings. I should feel free to voice my opinion and feelings on a groupbuy I'm participating in. Why would you and the other individuals feel it necessary to attempt to shame me for feeling a certain way? I did not say anything about the way donutcat is handling the group buy, did I? Please, tell me when it's appropriate to voice my frustration? Thanks donut. Your updates have been fantastic. I always expect delays in gb, but your updates have squashed any doubt or worry that I might have had. Looking forward to building this guy. Small update, the boards are on their way to me but slightly delayed in a warehouse. I'm needing to get ahold of them to clear something up about transporting them, didn't get much from the initial email except something about magnets, so I'm assuming it's something to do with them being a large batch of boards with controllers and the notation on them. Hopefully this can be resolved pretty quickly and they can be back on their way to me. If all goes well I'll be able to start invoicing for shipping before Halloween. If all goes well I'll be able to start invoicing for shipping before Halloween. Yeah, there was another small issue with the warehouse, the shipping weight was apparently more than their automated system would let me pay for so I needed to contact them to get it manually priced and paid for. I did that Sunday night and the payment went through without issue, so it's another waiting stage for the time being. In the meantime I've been working on getting the shipping materials lined up so they'll be here and ready the moment the PCBs get to me. I see, no worries. Happy Halloween! I thought this was finished already. I’d be down for extras if they become available. So, after several days of contacting different people and all of them being wonderful for dealing with my english, I finally have tracking for the PCBs headed to me. No estimate on when they'll get to me exactly, but it's better that way imo since it won't be an accidental underestimate. Next update should be unpacking the PCBs and starting some order packing. Thanks for the update. Are the PCBs in the States already or do they still need to travel here and go through customs? I'm just worried as the Paypal protection ends this month and I know it takes forever for things to get into the States. I guess I need to start deciding on which switches I'm gonna use. PCBs are here, no pics of the black yet cause I haven't gotten that far into the boxes. I'm currently going through them and testing for functionality while waiting for boxes to arrive, then I can begin packing the first of the orders and invoicing for shipping. I'll probably be prioritizing getting the remaining Phantom orders out first so I'm not dealing with as many different things at the same time and therefore less chance of shipping hiccups. 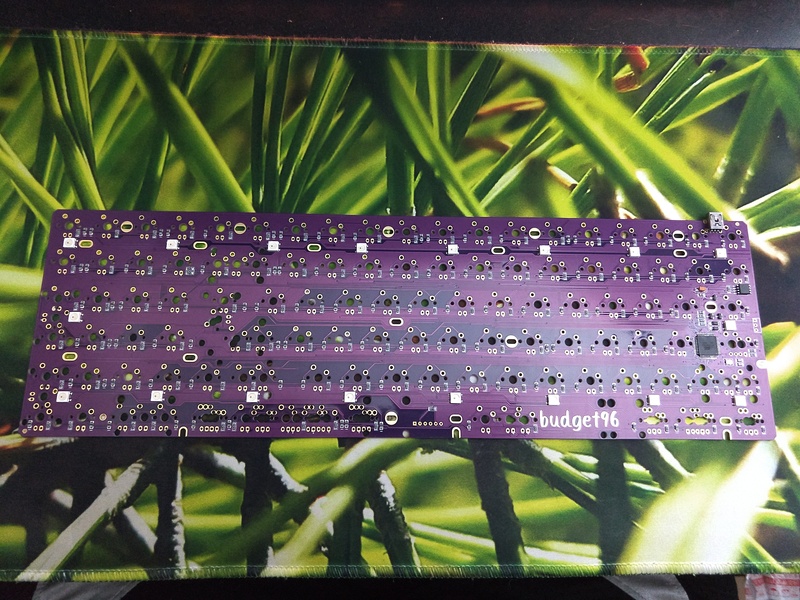 Re: [GB] budget96 - PCBs Here! Whoo! Thanks for the update! Honestly I am totally ok with you taking your time. I don't speak for everyone but even if this took till January I be ok with that. Reason I say that is shipping during the Christmas holiday is a PITA at best.. I look forward to this thought. I am excited those PCB's look AMAZING! Yea, thank god you don't speak for all of us. Full text condensed below for space. As you can imagine, I'm absolutely ****ing pissed at what I've seen so far, especially the sheer incidence rate of the issues found. When I first dug into the boxes I thought that the packaging was actually pretty good, bundles of 10 PCBs in pairs with plenty of bubble wrap. What I didn't know right then was how putting them in pairs instead of separately in the wrap leads to the throughhole pins on the USB Mini connector to be able to scrape the everloving **** out of the adjacent board, leading to the main issues, though some of the scratches and residue looks like it's an artifact of the manufacturing of the PCB and should have been found before they even left the PCB fab. If whoever packed the boards hadn't been so intent on saving $.20 of bubblewrap per bundle I'm fairly confident that a fair bit of the issues shown in that album would not have been present and many of the boards pictured there would have needed minor cleaning at the most; the fact that all but a couple of the boards have no visual flaws on the back of the PCB reinforce this thought. Like I mentioned, I'm pretty ****ing upset that this happened, so much that I've pretty much been just in a state between angry and disgust at the problem since I found out about it and been in a **** mood this whole week as a result. I'm planning to look through more of the bundles of PCBs over the weekend between more Phantom orders and working on stabs and see if the trend continues, which at this point it seems quite likely it will. The plan after that is to send a carefully thought out email to the seller explaining the situation in detail, including that album and further pictures that I take, and as tactfully as possible tell them that this is absolutely unacceptable and they need to do something about it. I'm not confident that much might be done, but I am pretty confident in the power of a very large PayPal dispute pointed their direction as a good motivator, if the need arises. Also due to this, I'm planning on taking a close look at all of the plates over the next week to make sure that they're going to be fine. I've left most of them in their original packaging(keep the dust and cats off of them) after inspecting a small number of each color, but this whole deal has left me nervous about potential issues with any of the components involved and I want to catch anything as soon as possible at this point. If would oblige me, feedback concerning this situation would be much appreciated since right now I'm still just overwhelmed with being upset about this and could really use some outside thoughts on this. Someone in the discord thought that maybe I was overreacting to some of the issues, particularly concerning the price point I was able to get the PCBs for, and who knows maybe I am. I was pretty much expecting a perfect product to show up and maybe that was too much of me to expect. So far all of the PCBs that I've plugged in to test have taken the firmware update, had their LEDs working, and had random selections of keypresses work just fine as well, aside from one board with a crushed USB connector that I didn't bother to mess with yet, and only one or two have had anything wrong with the back side of the board, all the visual issues have been on the front of the board only for the very vast majority I've seen. Please bear with me while I deal with this the best I can, I'm doing my best to make sure everyone receives the product that they deserve and I'm hoping everyone can understand that. I'm definitely not speaking for everyone who participated. For me though, as long as the PCB doesn't look like it was half-eaten by a bear and IT'S WORKING, and ports align with the plate and usb cutout, I would be fine with it (the PCB). It's all light superficial issues, based on the pictures. The case, though, is where I'd be more nit picky, since it affects aesthetics directly. I've no problem with the wait, and also appreciate going through each of them to check the issues. I agree. I would appreciate you contacting the vendor and checking your options but I would not be upset about small scratches that aren't visible in the final build. I understand some are worse than others, but most of the issues looked small. The top and bottom plates are more important for surface scratching. Thanks for your hard work and attention to detail. just speaking for myself, i would still buy these if you were fairly certain that they still worked. i was expecting much worse pictures after reading the text first. i agree that it's not ideal and super dumb to try and save pennies and risk all these scratches. from a GB participant perspective, my worry would be if these boards are long term reliable but given the light damage i would think yes and still would take it. just my two cents. As long as it works I don’t mind the scratches. I’ll never see the thing after assembly. I don’t mind the scratches as long as they pcb works. I'm in the same boat as above. The blemishes are disappointing, certainly, but as long as it doesn't affect the function of the board, I can live with it. Especially so that these are mostly on the back of the board. I'm totally okay with living with it as long as you are confident that they work. Either way, thank you so much for you transparency and frequent updates! Honestly... I would be totally okay with blemishes as long as everything works. Will there be B-stock extras, by chance? I been thinking about this all day and my biggest concern is the damage isn't just cosmetic. The pictures some of them look pretty badly damaged and you even mentioned possible issues due to some of the scratches. Thais my big thing, if the board can be proven to just have cosmetic damage then no big deal. The damage is cosmetic only contact the manufacture and try to get a discount on the board's perhaps to pay for shipping or what have ya. The boards functionality is questionable that is another story obviously. Thanks for being so transparent about this entire thing. I know its gotta be frustrating thought I guess we all should have seen this coming as cheap as the manufacture was willing to produce them. At the end of the day I don't really expect a budget product to be cosmetically pretty I just expect it to work. On one hand I prefer things look good even if they can't be seen, but if those scratches are truly cosmetic I don't think the added delay would be worth it. Cases and plates are visible, so those are going to be what matters. I could care less about scratches. As long as they work normally I will gladly accept my order. I figured that most GB runners don’t test every individual switch socket on every PCB. If that is the case and these scratches are going to cause you to spend a ton of time testing, that seems unfair to you. If we get boards that we need to fix, it seems unfair to us. Seems like the only way for everyone to win would be replacement boards. But we could just try our luck and send them out at a discount. Then we could return boards we find to have issues. Just rambling now. As long as they work 100%, I don't mind those blemishes.